Long before he received an Academy Award nomination for Best Director (2006’s United 93), Paul Greengrass made his directorial debut with the tightly-wound, little-seen Resurrected in 1989. This was also before Greengrass would make his mark on the Jason Bourne franchise (with The Bourne Supremacy and The Bourne Ultimatum). His most recent outing, the 2013 Best Picture nominee Captain Phillips, helped cement his reputation as a major league filmmaker. So it’s of great value that Twilight Time has resurrected Resurrected as part of their Limited Edition Blu-ray series. 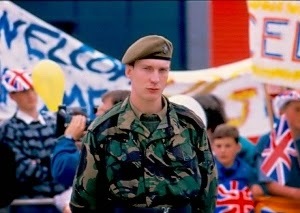 The British film also launched the career of actor David Thewlis, who stars as shell-shocked soldier Kevin Deakin. The year is 1982 and the 74-day Falklands War has ended only several weeks earlier. The Deakin family has just laid Kevin to rest, burying an empty casket because the MIA Deakin was presumably KIA. But, thousands of miles away across the Atlantic Ocean, Kevin has stumbled up to the home of a U.K. couple living in the Falklands (the islands are located to the east of the southern tip of South America). He’s been in hiding for seven weeks, but the big question is whether or not he deserted his company. His story: temporary amnesia, induced by an explosive firefight, left him unsure whether the war was still being waged. His skeptics’ claim: he turned tail and cowardly hid while his fellow soldiers fought on. Most of Resurrected details Deakin’s reintegration into society, dogged by media scrutiny and racked by untreated PTSD. He’s having trouble with his girlfriend Julie (Rudi Davies), who doesn’t understand why Kevin has returned a changed man. Younger brother Gregory (Michael Pollitt), in a touching gesture of familial solidarity, loses friends at school after they accuse Kevin of being yellow-bellied. Worst of all, upon his return to active duty after a very brief, superficial inquiry, Kevin is ostracized and bullied by his military comrades. The disoriented, paranoid mood that Greengrass establishes early on is maintained throughout, pulled increasingly tighter as the film rolls toward what feels like an inevitable climax. The only real problem is that the story (which is based loosely on the true events of real-life soldier Philip Williams’ similar “return from the dead”) isn’t quite full enough to support even the relatively brief 92-minute running time. It’s a minor film, but a confident one. It’s just that it might’ve had a much stronger impact had Martin Allen’s screenplay developed Kevin, Julie, and the particularly angry, accusatory soldier Slaven (Christopher Fulford) beyond one dimension. As it is the actors deliver sturdy work and the persisting ambiguities of Kevin’s circumstances keep Resurrected interesting, if not quite riveting. Resurrected looks generally solid, with a 1080p transfer framed at 1.78:1 that shows off a very clean source print. Ivan Strasburg’s original cinematography looks muted to begin with, so it’s not surprising that colors aren’t exactly vivid. Black levels and shadow detail are good, even in the stylized battlefield flashbacks. The DTS-HD MA 2.0 soundtrack is also clean, though the location sound – natural though it may be – results in some muffled dialogue. That’s no fault of the Blu-ray presentation. A pair of relatively recent interviews is included as supplementary features. One features director Greengrass and the other is with star Thewlis, each running about 15 minutes. There’s also the standard Twilight Time isolated music track, spotlighting John E. Keane’s score. Film historian Julie Kirgo adds another of her thoughtful essays in the Blu-ray booklet. Visit Screen Archives for ordering information. 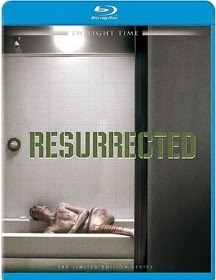 The Resurrected Blu-ray is a limited edition pressing of 3,000 copies.